Easy, no bake granola bars! 6 ingredients and just 10 minutes to make. Watch the video to see how simple they are! My kids love granola bars and I wanted to make something that was both simple and healthier than store bought alternatives. They are naturally sweetened with raw honey and freeze dried strawberries. You can pick up freeze dried strawberries at most grocery stores in the natural section. Also, Trader Joe’s sells them for a very reasonable price..
Don’t skip the step of pressing them firming into the pan for two full minutes. You must press them firmly into the pan so that they stay together nicely. Also, don’t forget to press down the edges! 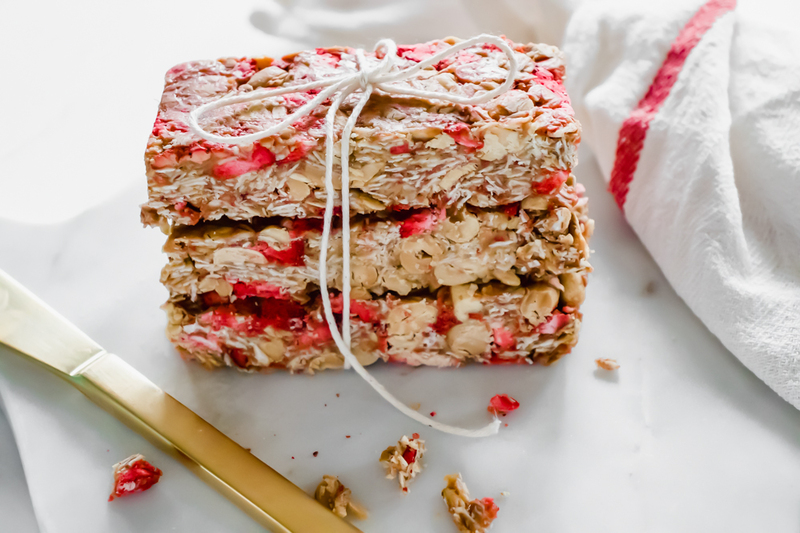 These PB&J granola bars will keep in the fridge for up to two weeks or on the counter for one week. Makes 8 small granola bars or 6 large bars. 10 minutes prep. Refrigerate 2 hours. Line a 9 x 9 square dish with parchment paper. Stir the natural peanut butter before measuring out a 1/2 cup (it usually separates some). In a medium sized bowl, combine the 1/2 cup peanut butter and the 1/2 cup raw honey. Stir to combine. Add 2 cup of oats and 1 cup peanuts. Sprinkle in the 1/4 teaspoon of salt. Stir to combine. Add 1 1/2 cups of freeze dried strawberries. Stir to combine. Add mixture to the parchment lined dish. Using a large spoon, press it down firmly into the pan. I hold the spoon with one hand and then use the other hand to press the spoon down firmly. Next, add a piece of parchment paper or wax paper on top and press it firmly using your palm or your fist. Press the mixture into the pan for 2 full minutes until it has been compacted down into the pan. If you do not press it down enough, the bars will be crumbly and will fall apart. Remove the paper on the top when done. Put in the fridge for 2 hours to firm up. Cut them into bars or squares. You can store them in the fridge, covered, for up to 2 weeks or in a sealed container on the counter for up to one week. To store them in the freezer, separate each bar with a piece of parchment or wax paper and place in a sealed container for up to several months. Please note, children under one year old should not consume raw honey. You can substitute any nut/seed butter than you prefer.